The Code(Her) Conference is the premier 2-day conference where women (and men) come together to learn the latest in internet technology! Code(Her) Conference brings in the best in tech from the DC-area. The Code(Her) Conference is different from other tech conferences – NO non-interactive presentations, droning panels or superficial lightning talks! At Code(Her) I presented a 60-minute workshop on creating a content strategy for attendees’ businesses or personal brands. The foundation of this strategy centered on a content calendar and defining your online presence and goals. Attendees left with a completed Content Worksheet and a Content Calendar Template full of ideas for their brands. From the White House to Fortune 500 company leaders, the annual program features the environmental industry’s brightest and most innovative speakers. 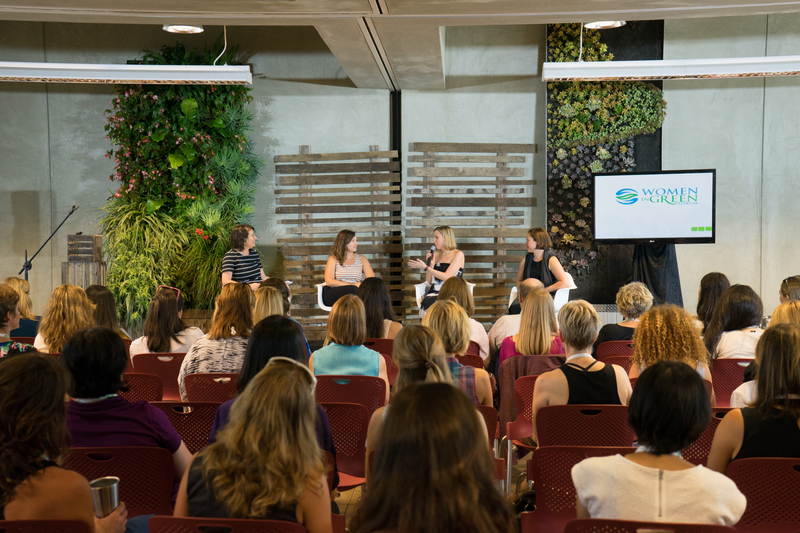 The mission of the Women In Green Forum is to create a venue for sustainability professionals to develop the skills necessary for professional success, to promote women’s leadership across the environmental industry, and to channel our efforts to build a better world where both genders have equal access to and are involved in leadership and decision-making. Offering a blend of interactive sessions, spotlight presentations, and curated tech demos, the Forum provides attendees with a platform to form effective relationships with key players in the environmental industry. I joined a panel focused on digital campaigns: initiating and motivating action online for environmental causes. We discussed how to start a cause-based online campaign, finding your audience, corporate social responsibility, dealing with negative online comments, and more. “Green is Good,” hosted by ERI’s Executive Chairman John Shegerian, is America’s top environmental and sustainability podcast and radio show. Each week, Shegerian interviews top business leaders, entrepreneurs and organizations working to make the world a better — and greener — place. Broadcast weekly on America’s Talk Channel on iHeartRadio, reaching over 60 million subscribers, and available from over a dozen syndication partners, “Green is Good” discusses eco-friendly initiatives, sustainable practices, pressing environmental issues, recycling technologies, green advice and much more with some of the world’s most influential and innovative people. In my interview, I discussed how digital marketing can help encourage people to take action to help the climate and make the world a greener place.